Definition at line 111 of file lscript_tree.h. Definition at line 114 of file lscript_tree.h. Definition at line 119 of file lscript_tree.h. 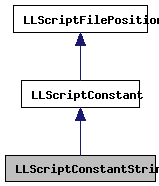 Definition at line 314 of file lscript_tree.cpp. Definition at line 264 of file lscript_tree.cpp. References LLScriptByteCodeChunk::addByte(), LLScriptByteCodeChunk::addBytes(), LLScriptByteCodeChunk::addInteger(), gErrorToText, LLScriptGenerateErrorText::getErrors(), LOPC_PUSHARGS, lsa_create_data_block(), LSCP_EMIT_ASSEMBLY, LSCP_EMIT_BYTE_CODE, LSCP_EMIT_CIL_ASSEMBLY, LSCP_LIST_BUILD_SIMPLE, LSCP_PRETTY_PRINT, LSCP_TO_STACK, LSCP_TYPE, LSCRIPTOpCodes, LLScriptByteCodeChunk::mCurrentOffset, LLScriptConstant::mType, mValue, print_escape_quotes(), S32, and size. Definition at line 128 of file lscript_tree.h. Referenced by getSize(), recurse(), and ~LLScriptConstantString().